This truly unique and beautiful property is a North Shore favorite! Seagull House is a Frank Lloyd Wright inspired John Howe home on Lake Superior near Grand Marais, MN. This home has 3 bedrooms, 3 bathrooms, and a beautiful private section of Lake Superior shoreline. Walk on in and enjoy the unique architecture of this prairie-style home. Seagull House is a unique and awe-inspiring home on Lake Superior. The large open living area has plenty of seating for the whole family plus the unique touch of a baby grand piano. The windows allow you to take in the amazing views of Lake Superior from the living room and kitchen. The living room is open to the large kitchen, perfect for preparing meals during your stay. Large enough for more than one chef, plus great views of Lake Superior. What more could you ask for Each bedroom in this home features a queen sized bed and furniture that has been specifically designed for the space. Not to mention many windows that allow in tons of natural light. The walk out lower level leads down to the ledgerock shoreline. Each of the 3 bathrooms in this home features a tiled walk-in shower. Enjoy the large lake-facing deck for your next summer time BBQ on the North Shore. Then stroll on down to the private ledgerock beach area. Enjoy the views of the Big Lake all year long at Seagull House. Cascade Vacation Rentals is pleased to offer this unique example of American architecture located on the wild shores of Lake Superior just outside Grand Marais, Minnesota. Seagull House has a strong connection to the most famous American architect, Frank Lloyd Wright, and is an excellent example of Prairie architecture, for which Mr. Wright is known. John Howe, architect of Seagull House, was Mr. Wright's chief draftsman at Taliesin for more than 25 years and designed and built this home, which is now available to rent as part of your North Shore experience. This 3 bedroom, 3 bathroom home is located a short drive up the shore of Lake Superior from the quaint lakeside town of Grand Marais. The unique angled rooms, low-pitched roof, and open interior spaces in this home are staples of the Frank Lloyd Wright prairie-style architecture that John Howe helped make famous back in the 1940s and 50s. Each room is carefully constructed and designed so that nothing is there by accident. Every piece of furniture, artwork, and even the knickknacks have been selected to match the design elements intended for the space. Because of this, many pieces in this home hold great value and it is why we do not recommend this property for families with young children. The unique architecture isn't all this home has to offer! Nestled on a beautiful plot of land against the shores of Lake Superior, you will get to enjoy a private ledgerock shoreline with easy to moderate access so you can enjoy the sights and sounds of the Big Lake. There is a gas and charcoal grill so cooking a meal outside in the warm summer months won't be an issue no matter what your grilling preference is. On cold winter nights you can curl up in front of the wood burning fireplace and enjoy a book on John Howe and Frank Lloyd Wright's architecture while sitting in one of their homes! Large windows take advantage of the Lake Superior views and the well-equipped kitchen allows you to make a delicious home cooked meal. You'll feel right at home at Seagull house. The location up the shore from Grand Marais means you have ample amounts of privacy but are also close to everything the North Shore has to offer. Miles of hiking, biking, snowmobiling, and cross-country ski trails are just a short drive away. Several state parks are also easy access from this home. Or head on into Grand Marais and do some shopping at the unique ma and pa shops that make the area so unique. No chain stores here! The restaurants are also one of a kind! You could easily spend a month at Seagull House and still find a new spot to explore and enjoy. We went up to enjoy a late fall colors long weekend with the promise of pretty decent weather. While the farmers almanac forecast for that weekend didn't prove accurate our stay at the Seagull house was extremely delightful. The heaters and fireplace keep everything toasty and we were able to get a close up view of lake superior's fury at its finest!!! I mentioned to my wife that the Seagull house is my happy place. It is very artfully designed and appointed, remote for those seeking a private getaway experience, and just plain relaxing. I just wish I would have stuck with my piano lessons as a young child so I would have been able to play something decent on the grand piano. Very professional and good to work with! The Seagull house is a fabulous property. It is the perfect location the comprises a beautiful house in the midst of breathless scenery. A true gem of house and location. 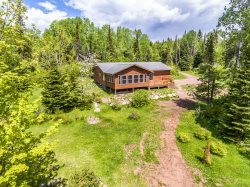 Only six miles from Grand Marais, but light years from the hustle and bustle of busy life as long as you stay focused on family and nature and off of their convenient WiFi! The space was truly a living space. The home is beautiful inside and out. There are a couple quirks mainly sound carries to the bed space from the living space so well I could hear my partner putting together a puzzle. Also the lighting is based in the soffit structure around the perimeter of the building so central areas are a little dark. The audio visual equipment is not quite top of an audiophiles list. That being said it is on the list. The componentry took a little figuring out, and the instructions provided contained instructions for a dvd player that had been replaced. and this led to a totally different set of tasks to get video and I pod functions. On the stormy days we had access to an ample if older supply of DVD's. However, the Dish Network had almost no channels and the ones that were available were primarily stations that showed continuous infomercials. The new dvd player did have Netflix, Hulu and Youtube but was not connected to the internet so we had no access to them or HBO go. we missed GOT (grumble grumble) Stacie absolutely loved the Frank Lloyd Wright puzzles and completed two of them during our stay. we had to borrow a reading lamp from one of the downstairs bedrooms to get enough light for the puzzles though. The home itself is picturesque inside and out. I am a design/builder I would have loved to study the set of plans to get a more comprehensive understanding of Howe's organization of the space both visually and physically. There are organizational elements that seem to register in my subconscious mind that I cannot bring to the conscious side. Howe must'ave been the backbone of Writes work. The design elements in this home are proof of Howe's architectural skill and fundamental understandings of space. I've thought this for a long time and spending days in the space has affirmed it. This home is a home that was designed to be lived in and to enhance the live of those living in it. If you are an architecture buff or not this space is truly wonderful and spending time in it will enhance your life. We loved the property, it was beautiful. Being able to use the garage and laundry was terrific! We had everything we needed, we ran out of propane for the bbq and called the office - within 45 minutes we had a full tank! The location was great! It was a quick drive to Grand Marais; the Superior Hiking Trail and other hiking was very convenient. Access to the lake was easy and we were able easily kayak from Seagull. The home was perfectly sized for 6 adults! We liked the Seagull House. The view was amazing, the kitchen was awesome, the beds were very comfortable and everything was clean. Our one suggestion -- we wish the living room/great room had more comfortable furniture to sit and watch the lake. We looked forward to our vacation at Seagull House from the day we made our reservations in January, and we were not disappointed. We felt as though we were staying in a piece of history. The views were magnificent. It did not have the most comfortable furnishings, but it was true to the Frank Lloyd Wright tradition. The beds were very plush, so we slept well. We loved every moment of our stay and hated when our week was over. This was a beautiful spot, we did not want to leave! Everything was perfect, we had much more than what we needed. The sound of the lake was calming and hit the spot for tranquility.